What would happen if you woke up one day without a clue in the world as to who you were? You don’t know where you live, you don’t know who your family is... you don’t even know your own name. Your whole life is a complete mystery to you, and the only thing that’s clear is that for some reason, you are the most wanted individual in the whole world. Welcome to the life of secret agent Jason Bourne. 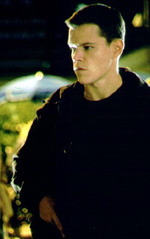 Based on the best selling novels by Robert Ludlum, The Bourne Identity follows an amnesiac (Matt Damon) whose only connection to the life he once led is a passport with his picture and a name. As time passes, certain abilities come back to him — self-defense tactics, speaking several languages fluently — but outside of the fact that the government would rather have him dead than alive, his background still remains a mystery. On the run with nowhere to hide and no one but a German stranger (Franka Potente) to trust, Bourne is in a race against time not only to save his life, but also to remember the life that he’s trying to save. Although The Bourne Identity prides itself on being a 21st century espionage thriller, when you strip away Swingers director Doug Liman’s signature edgy and sleek style, what lies beneath is just the same old spy film. A movie filled with action, suspense, car chases, gunfire and a forced love story, The Bourne Identity is nothing new or original. Some of the action sequences will have viewers at the edge of their seats, waiting in suspense, and a couple sudden attacks may make a few viewers jump, but the screenplay penned by Tony Gilroy and William Blake Herron is filled with the typical spy film clichés. Fans of the genre will find the storyline as predictable as a Scooby-Doo cartoon, making the movie — at only 118 minutes — seem far too long. This is a shame since the movie starts off on a high note. The first 45-minutes or so of the film is worth the price of admission alone, and viewers will truly feel as though they are joining Bourne on his race against time. Watching as Bourne’s secret agent abilities slowly come back to him is both exciting and entertaining to watch, especially since the character has no idea why he can speak French or do black-belt karate moves. Unfortunately, Liman carries on the whole Bourne-discovering-himself bit for most of the film, making what was once entertaining and interesting, boring and tiresome a good hour later. Granted, by then the action scenes pick up the pace, but the explosions and chases can only keep viewers interested for so long before they just want Bourne’s memory to come back and have him stand up to his “creator” (Chris Cooper). Despite the predictable plot and relatively slow pace, The Bourne Identity manages to keep audiences semi-awake an hour and a half into it thanks to a decent performance by Matt Damon. Although the script doesn’t give him much to work with, Damon does his best to keep the Jason Bourne franchise alive on the big screen and is reason enough to come back for a sequel. He plays the average Joe so believably that audiences won’t have any trouble believing deep inside he’s just like anyone else — even with his special skills and criminal background. And, for some reason, having the safety of the world one day land in Damon’s hands is both more believable and more soothing than leaving the fate of mankind to Ben Affleck, a la The Sum of All Fears. As for the rest of the cast, Chris Cooper — as always — is splendid at being the bad guy. Although his role as Ted Conklin is similar to the parts he’s been pigeonholed in since his memorable performance in American Beauty (as soon as viewers see him they’ll know that he’s the bad guy), the persona he now carries with him from film to film makes it all the more easy for viewers to hate him. Unfortunately, the women in the film — Run Lola Run star Franka Potente and Save the Last Dance’s Julia Stiles — truly take a back seat to the male performances. Given the questionable romantic subplot and the film’s use of Potente as merely Bourne’s taxi driver, Potente is nothing more than just a tagalong love interest. As for Stiles, given the fact her small role could have easily been played by a no-name actress without making a bit of difference, viewers will be left questioning why she was even cast in the first place. When all is said and done, The Bourne Identity is yet another example of why popular novels shouldn’t be adapted for the big screen. For while on paper the story of an amnesiac spy on the run for his life may be a real page turner, in Hollywood it’s simply a bore. Avid moviegoers have seen it before, and even a few stylized and semi-original action sequences can’t hide its predictable outcome. While fans of Ludlum’s novels may still enjoy the film, the rest of America can easily wait until DVD when it’s easy to skip past its many espionage clichés.